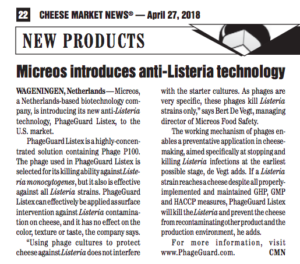 We are proud to announce that Micreos’ PhageGuard Listex solution is featured in this week’s Cheese Market News (Volume 38 number 15 of April 27,2018) under the “New Products” section. — Micreos, a Netherlands-based biotechnology company, is introducing its new anti-Listeria technology, PhageGuard Listex, to the U.S. market. PhageGuard Listex is a highly-concentrated solution containing Phage P100. The phage used in PhageGuard Listex is selected for its killing ability against Listeria monocytogenes, but it also is effective against all Listeria strains. PhageGuard Listex can effectively be applied as surface intervention against Listeria contamination on cheese, and it has no effect on the color, texture or taste, the company says. “Using phage cultures to protect cheese against Listeria does not interfere with the starter cultures. As phages are very specific, these phages kill Listeria strains only,” says Bert De Vegt, managing director of Micreos Food Safety. The working mechanism of phages enables a preventative application in cheese-making, aimed specifically at stopping and killing Listeria infections at the earliest possible stage, de Vegt adds. If a Listeria strain reaches a cheese despite all properly implemented and maintained GHP, GMP and HACCP measures, PhageGuard Listex will kill the Listeria and prevent the cheese from recontaminating other product and the production environment, he adds.